Many pipe type plastic tools for medical treatment such as one-off injector, one-off injection acus, one-off scurf acus, one-off transfusion (blood) set etc. Product function: this machine can quick melt down acus head; lacerate the ampoule of injector and rubber stopper with simple and convenient operation. 1. Put the tri-core electric source into the socket of AC220V; open the switch at behind and the indicator light of electric source turns into red. 2 . The injector with pinhead can plug into the right cutting room to press the injector, push forward; after the pinhead melt, it will hear the sound of the machine working; at this time, the indicator light will be green, push it continually, finish cutting, melting and then recall; last it should be damaged by damage-shape machine. 3 . Scurf acus and other steel acus can plug into the front melt entrance with melting; when operating, it should rotate the pinhead lightly to melt quickly. work with low electric voltage to melt the needle instantly,double over-heated protection is provided. 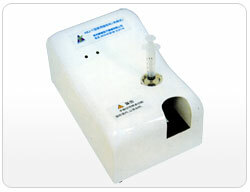 Surplus liquid in the needle will be vaporized to avoid pollution. Nearly no spark ejects during operation, the whole process lasts for 1-3 seconds. Indicator light sparks during melting, showing the needle is under destroying, the whole process is finished in 1 to 3 seconds. needle touches the electrodes inside. The whole process lasts 3 seconds. There is a taphole at the bottom, under which there is a rubbish drawer to collect waste residue. Please clean the rubbish drawer after using some time (usually after melting 50pcs of syringes). This device is mainly designed for destroying the insulin needle as well as acupuncture needle and other micro-needles, taking only 1-2 seconds to melt needle easily .